Studded with glaciers, filled with wildlife, and surrounded by parkland: lovers of the outdoors can find it all in Anchorage. When adjusted for inflation, airfares into Anchorage are at lows not seen in 20 years. Anchorage has no sales tax, and many of the best things to do on a quick visit are free (like access to the paved trails system) or a minimal cost (parking for a day hike in the Chugach Mountains is $5). Getting to Anchorage is easy, and getting around is easy too. The ride from Anchorage’s airport to downtown hotels is about 15 minutes; a short ride leaving plenty of time to start exploring right away. There are some unbelievable experiences incredibly close. See a moose in the first hour, catch a salmon a short walk from the hotel, or step out on a glacier and be back in time for dinner. The Chugach Mountains sit just to the east of the city, and have more than 300 miles of trails, as well as many of those famed Alaska glaciers. Trail heads like Glen Alps are less than 20 minutes away, and among the most popular spots for a quick introduction to Alaska’s natural assets. This part of Alaska has a huge concentration of pilots and small planes, especially at Merrill Field and Lake Hood Seaplane Base. Flightseeing tours run the gamut: Go view bears at a remote spot, dogsled on a glacier, kayak at a remote lake, or circle Denali. Each is an easy few hours or day trip. When adjusted for inflation, airfares from Seattle into Anchorage are at lows not seen in 20 years, according to data from the federal Bureau of Transportation Statistics. Anchorage has no sales tax, and many of the best things to do on a quick visit are free (like access to the paved trails system) or a minimal cost (parking for a day hike in the Chugach Mountains is $5). Find more adventures for less. Getting to Anchorage is easy, and getting around is easy too. Flights depart about once an hour on Alaska Airlines, JetBlue and Delta, and Anchorage is a 3-hour nonstop flight from Sea-Tac. The ride from Anchorage’s airport to downtown hotels is about 15 minutes; a short ride leaving plenty of time to start exploring right away. What can you pack into more than 20 hours of daylight? A lot! 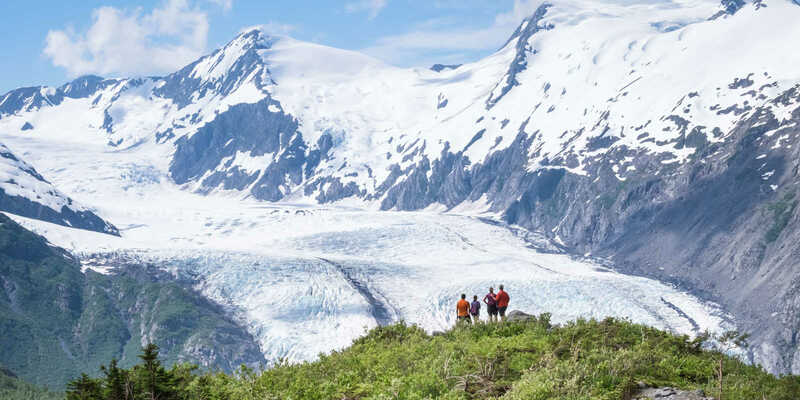 The Chugach Mountains sit just to the east of the city, and have more than 300 miles of trails, as well as many of those famed Alaska glaciers. Trail heads like Glen Alps are less than 20 minutes away, and among the most popular spots for a quick introduction to Alaska’s natural assets. When adjusted for inflation, airfares from Portland into Anchorage are at lows not seen in 20 years. Anchorage has no sales tax, and many of the best things to do on a quick visit are free (like access to the paved trails system) or a minimal cost (parking for a day hike in the Chugach Mountains is $5). Getting to Anchorage is easy, and getting around is easy too. Flights depart on Alaska Airlines and JetBlue, and Anchorage is a 3.5-hour nonstop flight from PDX. The ride from Anchorage’s airport to downtown hotels is about 15 minutes; a short ride leaving plenty of time to start exploring right away. When adjusted for inflation, airfares from Los Angeles into Anchorage are at lows not seen in 20 years. Anchorage has no sales tax, and many of the best things to do on a quick visit are free (like access to the paved trails system) or a minimal cost (parking for a day hike in the Chugach Mountains is $5). Getting to Anchorage is easy, and getting around is easy too. Flights depart on Alaska Airlines and Delta, and Anchorage is a 5-hour nonstop flight from LAX. The ride from Anchorage’s airport to downtown hotels is about 15 minutes; a short ride leaving plenty of time to start exploring right away.